This is a stunning painting that now hangs in the Museo Nacional del Prado in Madrid, Spain. It is an oil on canvas and measures approximately 10’5″ x 9′. It forms a culmination of works and techniques that the artist had used in earlier works. The mirror in his Rokeby Venus, and in Christ in the House of Martha and Mary, we see a similar type of foreground and background interaction happening, with Mary and Martha in the foreground, with Christ and his disciples in the background. Las Meninas is one of Velázquez’s greatest works of art. It was painted in 1656 and Las Meninas simply means, “maids of honor.” It is a work which truly marks the upper class, as we see at the center of the composition, the blond Infanta Marguerita. She was the daughter of King Philip IV and Queen Mariana of Spain. The painting shows the girl not in her regal attire (there is no crown for a start), but in a setting of the artist’s studio, herself being painted. It shows her servants around her, along with a couple of dwarves, two adult figures, and at the forefront of the picture, a dog lying down. In the background, we see a mirror presumably with her parents in, standing where the viewer of the painting would be. The way the artist has captured the reflection and the light shining onto the bottom right hand side of this mirror is extraordinary. We also see the figure of Don José Nieto Velázquez the queen’s chamberlain looking in on the entourage. He was the head of the royal tapestry works of the time, so no doubt came in to check on the status of the piece. We can also see that the artist (Velázquez himself), is peering from his large canvas to look into a mirror and paint the reflection of the entire scene. This is why we see him in the painting as well. It is a curious, but very interesting perspective from which to paint. This painting was not meant for public display, it was primarily for the King’s private office and this is reflected by the very relaxed and comfortable setting, as opposed to the normal deliberately posed pictures we generally see of royalty. Of course for a royal, size is extremely important, and this painting is over 10 foot by 9 foot. This is a symbol of rank and distinction, not to mention the fact of being able to commission and then own such a piece. Added to this the prestige of someone of Velázquez’s skill and ability is also an important factor in portraying such lavishness. The focal point of this painting is of course the blond Infanta Marguerita. This is shown first by her central placing, and secondly by the light shining on her. Her dress is almost white, further enhancing her as the center point and the most important figure in the entire piece. Either side of her are her ladies in waiting, tending to her and ensuring that while she is relaxed and comfortable, she is still sufficiently beautiful and well-dressed. The dwarves and two adults (likely chaperones), behind the girl and her maids serve to offer a fine asymmetric balance opposite Velázquez and his large canvas, and further promote the importance of the central girl figure. It is a majestic painting, and while the light floods the foreground, we see how grand the room is in the background among its shadows. We see the forms of other large paintings in that background, and the scene is made more complicated by the two mirrors. We can see one on the back wall, but for the other, we are actually taking that vantage point. The entire scene is of course painted looking at a large mirror, and we can only assume that it is very large for it to reflect the enormity of the room. The complexity of the painting really is stunning. The nearly life sized figures, the way the lighting was used and the way the surrounding figures were painted in significance to the Infanta is quite remarkable. The illusion of reality is truly exceptional, and it was one neither Velázquez nor his contemporaries of his age ever came close to reproducing. Diego Velázquez was baptized on June 6 1599 in Sevilla, Spain. On his death in Madrid on August 6 1660, he had become Spain’s most important painter of the 17th century. His naturalistic style formed the cornerstone of his exceptional gift of seeing everything and transferring it to canvas. He was a master of both living and the still life. He came to Madrid in 1622, a year after King Philip IV came to the throne, in hope of royal patronage. Unfortunately for him, at this time there was no opportunity. After painting a portrait of poet Luis de Góngora, he returned to Seville. The next year, he was requested to return to Madrid by the prime minister, Count Olivares who later would become a patron of his. On this visit, he finally had the opportunity to paint a portrait of the king, and from there on, became the crown’s personal painter. The influence of this art work is immense. Pablo Picasso, himself painted around 58 versions of the scene, and its figures, all of which can be seen in the Las Meninas room of the Museu Picasso in Barcelona. Francisco Goya, painted Charles IV of Spain and His Family in a similar way to Las Meninas in his studio, although it greatly lacked the warm and relaxed environment of the former. Las Meninas is truly one of, if not the greatest painting Velázquez ever created, owing to its sheer size, use of lighting, focal point, and the many details, but never forgetting the original idea of painting through a mirror. 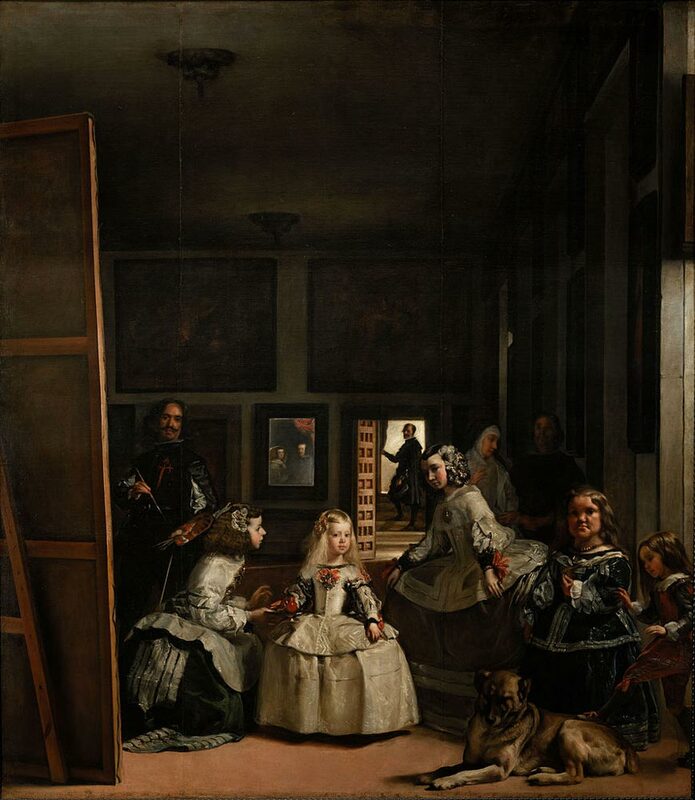 Las Meninas by Diego Velázquez is a piece of art that is a treasure. …Yeah…because no artists ever use studies or various different sittings to composite one painted image. This whole piece is so absurd. The only reason I even bother to post a response is because one my students cited this as a source. Horrible. Where are your sources? How about some quotations and citations? This is one of the worst interpretations of this painting I have ever come across on a generic web page (which says a lot). So in short, don’t consider this either accurate or historical. Please elaborate your discontent, I am interested in your reason.